Rafa did exactly the same thing in 2005. Took Didi off and brought Smicer on with 30 minutes to go. Mind you we were 5-1 up on aggregate at the time. How do you remember John Aldridge in a Liverpool shirt? The master of link up play, the exceptional header of the ball? That dark hair and tache combo? What match epitomized his grit and determination? What were his strengths/weaknesses? What are your best memories of him as a player? Those 63 goals? How will he be described in generations to come? In detailed analysis, describe and let us know here how you will always remember John Aldridge during his Liverpool career? "If your looking for consistent goalscorers then you won't find one better than John Aldridge. He netted 50 goals in just 83 League games for Liverpool. A true goalscoring wizard! Started as an apprentice at a Car builder while playing for Liverpool South then went to Newport and from there to Oxford before being signed by Kenny to replace Rushie. The lad came in and carried on where Rushie left off banging in the goals for fun and played his best football for us. Missed the first Pen in a Cup final which led to us loosing aginst the Dons but came back the next season and scored in the final against Everton. Great memories of a time when we were nearly unbeatable." @Broomy it almost goes without saying that your work is greatly aporeciated, and I'm more than willing to take time off thinking about Christian Benteke to add a few thoughts here. My memories of this era are that of a young lad. We moved from the south of England to sunny far North Queensland in the late 80s and somewhere there I decided I was a Liverpool fan. Upon arriving in Australia, my experiences of lfc were limited to watching 1 hour of first division highlights per week on the abc here, plus issues of 'British Soccer Weekly' my dad bought. In fact I think I worked out how to prerecord the VHS for this particular programme as an 8 year old! You often hear the phrase 'he looks like a Liverpool player', in fact I've said it myself (Lallana springs to mind). It's this era of players I think of, Whelan, Barnes and particularly Beardsley; technically gifted and combining to full effect! This was a fantastic few years where lfc were kings of England. I remember the 1988 FA cup final where Aldo famously had the penalty saved by dave besant. I must say though I didn't see the game live (although the FA cup final has always been shown live on TV here in Australia), it was on after midnight here and I was 8 years old! However I remember my dad telling me about the game, describing in detail how Liverpool were behind, and won the penalty with him thinking it was a formality that we'd get back into the game, settling in for a long night, only to see the penalty saved and Wimbledon celebrate a famous victory. Aldo had another couple of successful seasons, combining expertly with rush. He was metronomic in front of goal, that's the word I have for him. It's impossible to explain to younger fans accurately, but him and Rush had a confidence and level of expertise in front of goal that you very rarely see nowadays. More than that, Aldo was a real fan of lfc and long after his career ended, including now you can see he bleeds for the club. Years after he left lfc he continued playing for Tranmere, quite successfully too and managed them, for a time. I always looked out for their results and position in the table in the newspaper. Also really enjoyed watching him for the Rep of Ireland who had a great team under Jack Charlton, especially at USA 94. I could never understand why we couldn't get him back, even in the mid 90s! Geez, you think about those days, and to think people wonder why you don't get excited about signing a Belgium striker from a struggling Aston Villa side for an astronomical fee....what you'd give now for a striker of Aldridge's skill and goal scoring ability at LFC. Aldo was a great finisher-look at his record. i think we should have kept him a bit longer. He definitely will go down as a great because he played in that awesome 88 side. I went to Arsenal away in the first game of the season (all our first away games were away because a part of the Kop had collapsed!) and I wasn't sure about Alldo. However you could see his brilliance in front of goal- like Fowler- right away and he scored a great goal that day in the first game in our silver away shirts (first ever not white or yellow). Ole Ole Ole was the 'ring of fire' song that season and Aldo was fantastic. My best memory of him though showed what a great fella and team-mate he was. People might forget now but Beardsley, despite playing like King Kenny, started that season in a goal drought. Went a big spell were it just wouldn't go for him in front of goal. We played at Anfield (I think is was against Arsenal as well but I forget) and Aldo met a cross at the far post, Kop End, with the goal gaping. he just needed to nod in for an easy goal, but, he perfectly times his jump to nod the ball delicately over his marker for Beardsley to get his goal mojo back. You could see what it meant ot Beardsley and the lads as they mobbed him. We all sang his name for ages after that goal. he was such a passionate player and cared more about Liverpool than anyone between Kenny and Stevie. I love his commentary on the radio too. So many memories of Aldo... Anyone remember 'that' night on the Kop on September 12, 1989 against Crystal Palace when Aldridge played his last game for the club ahead of his transfer to Real Sociedad? What a match it was too... It was the 1989/90 season, when we smashed Crystal Palace 9-0 at Anfield in what was the club’s biggest ever top flight victory. Glen Hysen, Peter Beardsley, Gary Gillespie, Rush, Barnes, Steve McMahon, John Aldridge and two goals from Steve Nicol secured the win! Once again we faced Wolves in our final game of the season, and just like in 1947, we could clinch the league title (but perhaps this time without the wait), by winning or drawing. Wolves on the other hand had to win to avoid relegation. Dad had arranged to go the match with former Liverpool player Willie Carlin and a couple of lads from the supporters club. Dad and Willie arranged to meet the other two back at the car afterwards. Wolves went for it from the off and scored setting the nerves tingling amongst the Liverpool supporters, and the longer it went on, the more nervous they got. With 15 minutes to go, it was still 1-0 to Wolves after Steve Kindon’s thirteenth minute goal. There are some games that you never went to, but even if you did, Match of the Day makes something immortal because of the commentary. Wembley 1966 when Kenneth Wolstenholme. The first Newcastle 4-3 when it went “Still John Barnes…Colymooooore”. And then there was this game. For me, the commentary is that day is legendary. “On by Toshak to Keegan, and the old firm have done it”, followed by “Toshack taking his time…and using it to perfection; 2-1”. And finally, “Liverpool ending the match and the season in fine style...here’s Ray Kennedy lifts his left foot to make it 3-1, The Kop spilling onto the pitch to celebrate the victory, and the championship, and a championship won in style”. Upon final whistle, whilst the traveling Kop celebrated on the pitch, ‘Uncle’ Willie told Dad to follow him as he made his way down through the stands to the players entrance at which point he kept telling people that Dad was his friend, and made his way to the away dressing room. There is video footage of the dressing room after the game on the History of Liverpool, but Dad and Willie were not in the picture; however there is a famous photo of Ray Clemence swigging from a bottle of champagne and Dad says that he swigged from the same bottle. Keegan had that same bottle in the bath. Dad sat next to Keegan who had just got out of the bath and had a chat with him which came to Dad inviting King Kev to come and visit us at the Derby Branch. Kevin replied that he must talk to his agent first. How times were changing. Dad felt embarrassed because he did not want to take Willie away from talking to his mates – who just happened to be the league champions, but was also aware that the other two lads will be wondering what had happened to them (and I suppose how jealous they would be when they found out), so the party was cut short, but not everyone can say that they were in the dressing room after, what was, one of the most memorable matches in our history. Oh, and he got the programme signed too. Liverpool ‘s debut top flight season started at Ewood Park with an away draw at Blackburn with Harry Bradshaw opening our top flight account, and ended at Ewood Park in a test match verses Bury, who had won the second division with a 100% home record as Liverpool had done the year before (although 5 losses away from home could not match Liverpool unbeaten exploits of the previous year). Liverpool’s first season in the top flight had not gone well. It took 18 games to secure a first win in the home fixture with Birmingham City on 15th December with a 3-1 victory and Harry Bradshaw claiming two of them. Another Bradshaw double in the 4-0 defeat of West Brom on New Year’s Day, a further Bradshaw double against The Wednesday to secure a 4-2 win and a Bradshaw goal in the 5-1 victory over Derby County were the only games that Liverpool won at Anfield that season. The away form was worse with only a 1-0 victory at The County Ground, Derby to give solace in an abysmal season. To make matters worse, Liverpool lost to Everton in the first competitive Merseyside derby by 0-3, although the Anfield return ended in a 2-2 draw with Liverpool coming from behind twice, latterly with a goal by captain, Andrew Hannah after 90 minutes – the only goal of his whole career. With confidence low after a poor season and a number of missing regulars including captain Andrew Hannah, , vice-captain Duncan McLean, Joe McQue, John McCartney and Frank Becton, the management team of Barclay and McKenna brought in goalkeeper John Whitehead, centre half Robert Neill, and inside left James Cleland. Whilst Neill did go on and make 22 appearances for Liverpool during his season loan from Hibernian, Cleland was only on loan for the Test Match, courtesy of St Bernard’s in Edinburgh. Goalkeeper Whitehead has previously made 7 appearances for Bootle and 2 for Everton before playing this test match and 2 league games for Liverpool prior to his retirement. Hannah’s leadership and Frank Becton’s one goal every two game return was sorely missed, and three debutants in a poor side did not help. Goalkeeper and future Championship winning manager Matt McQueen played in defence and for once, Harry Bradshaw could not add to his respectable 18 goal tally for the season. On the field that day for Liverpool, only Bradshaw, Jimmy Ross and Malcom McVean had scored that season. As a result of the Ewood Park Test Match, Bury were elected to the First Division and Liverpool were invited to join the Second Division, which it accepted. This was the first season that was not a complete success for Liverpool and Willliam Barclay resigned as Secretary as a result, leaving John McKenna in sole charge. Always been one of my favourite games ever this, brilliant memories Andrew... Just had a quick look back at that day over on youtube, the day Bob Paisley's side won their 9th title at Molineux in 1976. 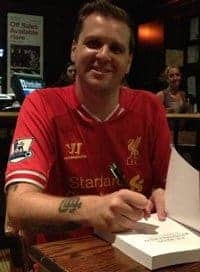 I just received another email, this time from the President of Vancouver LFC and author of the new Liverpool book "50 Ex Reds Remembered" - Steven Speed.... Here's an extract from his book he has just sent me where he takes a look back at "one of the greatest goal scorers British football has ever produced", John Aldridge... Another fascinating and enthralling article.... Thank you again Ste! Midway through the 1986/87 season the shocking news was announced that Ian Rush was leaving Liverpool to join Juventus for three million pounds at the end of the season. At the time this was very upsetting and devastating news for Reds fans, imagine how you would feel if you woke up tomorrow and saw the headlines that Gerrard or Carragher were leaving Liverpool. That gives you a rough idea how it felt back then with the news about Ian Rush going to Italy. So the speculation naturally began as to who would replace Rushie. I don’t think anyone genuinely believed it was possible to be honest, which just added to the pain and worry. A few names were bandied about in the press including Mark Hateley whose father Tony played for Liverpool in the 1960’s. Also linked was Charlie Nicholas of Arsenal, who a few months later went on to score the winner against Liverpool in the League Cup Final. An interesting fact about that particular match is that it was the first occasion in which we lost a game when Ian Rush had scored first. In January 1987 the speculation was finally over when Kenny Dalglish signed a Scouser who was also an Ian Rush look-alike, it was our man John Aldridge. He was signed from Oxford United on January 27th 1987 for £750,000. Aldo grew up on Merseyside as a huge Liverpool fan, spending many hours standing on the Kop cheering on his heroes. He was a great footballer at school and my dad and his brothers actually played against him in school matches. Due to lack of money for proper boots, my dad used to play footy wearing his dad’s old hobnail boots that were two sizes too big. One time in a game involving Aldo playing for a rival school team, my dad went to kick the ball and his boot flew off hitting the referee in the head, knocking him unconscious. What made the incident even funnier was that the referee was also my dad’s school headmaster! John Aldridge didn’t turn professional until he was almost twenty-one after plying his trade in non-league football for South Liverpool. He played for Newport County and then Oxford United with an outstanding goal scoring record at both clubs and at Oxford he had the fantastic achievement of a goal every 1.25 games. The end of the 86/87 season was quite depressing for Liverpool fans. We finished the season without winning a trophy. The league title was won by Everton, we lost in the League Cup Final and Ian Rush moved to Italy. Things could only get better but I don’t think even the most optimistic Kopite could have predicted just how much better things were about to become. The double signing of Peter Beardsley from Newcastle United and John Barnes from Watford was a masterstroke from King Kenny in the summer of 1987. The opening day of the 87/88 season was a sign of things to come as we beat Arsenal at Highbury with goals from Aldo and Steve Nicol. I’ve said this many times before and I will say it again now, this was the best Liverpool team I have ever witnessed. It wasn’t just the twenty nine game unbeaten streak, it was the way we played. It was a joy to watch the skill, especially from Barnes and Beardsley as we simply outplayed everyone we came up against. Memorable victories that season include the Barnes one man show against QPR and the famous 5-0 victory against Nottingham Forest. Aldo went on to score twenty six goals in thirty six games to help drive us to our seventeenth league championship. The only blip on the season came right at the end with the 1988 FA Cup final against Wimbledon. Aldridge had scored both goals in the semi final win against Nottingham Forest and going into the final we were the overwhelming favourites. I remember the night before the match I was talking about it with my dad and he was so confident he predicted a 5-0 win for Liverpool. We listened to the ‘Anfield Rap’ which was our cup final song that year and got in the mood for the next day which would surely end in a second double for Liverpool. Unfortunately The Crazy Gang had other plans. Vinny Jones instantly made his intentions clear when he whacked Steve McMahon hard from the kick-off and after that we never really managed to get into the game. I haven’t seen it since watching it live but from memory there were only two moments in the match in which I can recall us threatening to score. The first was a disallowed goal from Peter Beardsley when the referee had already blown for a Liverpool free kick and didn’t play the advantage. The second big moment is one of the most famous in football history when John Aldridge had a penalty saved by Dave Beasant. It was the first penalty ever to be missed in an FA Cup Final. A goal from Lawrie Sanchez was enough to give Wimbledon the trophy and stop us winning a second double in three years. Heartbreak was soon turned into excitement in the summer of 1988 when Ian Rush made a surprising return from Juventus after spending only one season in Turin. Speculation soon mounted as to who would be the preferred strike partnership with Aldridge and Beardsley both assumed to be competing to partner Rush. Most people predicted it would be Aldridge who would make way for Rush as it was thought that Aldo and Rushie were too similar and wouldn’t play well together. However this was proved wrong and people forgot that they had already played well together in the second half of the 86/87 season. It was actually Aldridge who had the more successful season as Rush took a long time to really get his form back after a bad season with Juventus. Starting with two goals in the Charity Shield win against Wimbledon, Aldo went on another goal scoring streak while Rush spent long periods on the bench. On the 15th April, 1989, ninety-six Liverpool fans died at Hillsborough during the FA Cup semi final against Nottingham Forest. The tragedy deeply affected the entire city of Merseyside and the players themselves. The entire team was absolutely devastated and local born players such as Aldridge and Steve McMahon were affected in an even deeper way having been supporters themselves. After a number of weeks without play the difficult decision was made between the club and the bereaved families to continue with the season and try to win in honour of those who had died. Aldridge scored in the replayed FA Cup semi final to set up the second ‘all Merseyside’ FA Cup final of the 80’s. It was the perfect final for this time as supporters of both teams came together. On Merseyside lots of families, including my own, contain both Blues and Reds. It was a terrific game, Aldo opened the scoring and Rush came off the bench to score twice in extra time and win the trophy for Liverpool in a three- two victory. Liverpool may have won the cup but the real winner that day was the city of Merseyside as the fans and players truly did themselves, the ninety six and the entire city proud.Unfortunately a second double was cruelly denied for a second successive season as Arsenal grabbed two late goals at Anfield to steal the title on goal difference. The second goal from Michael Thomas came in injury time with virtually the last kick of the season. I remember the game was on a Friday night and the most abiding memory I have of that night was my dad’s extreme anger when he returned from his weekly darts match at the pub. The following season Rush was fully settled back into the Anfield groove and early in the season Liverpool accepted an offer of one million pounds for Aldridge from Real Sociedad. In true Aldo style he bid his adoring fans a fond farewell, coming off the bench to score a penalty in front of the Kop in the 9-0 destruction of Crystal Palace in September 1989. At the final whistle an emotional Aldridge repaid the supporters for their support by throwing his boots and shirt into the crowd. The next day he became the first non-Basque player ever signed by Real Sociedad. Aldo was a huge hit in Spain and became a big favourite with the Sociedad fans. He scored thirty three goals in sixty three games before moving back to Merseyside with Tranmere Rovers in 1991. He made an instant impression at Prenton Park and scored a club record forty goals in his first season.It was while he was at Tranmere that Aldridge was involved in one of his most famous moments. It took place in Orlando, Florida during the 1994 World Cup in the USA. With Ireland trailing 2-0 to Mexico in the final group game, manager Jack Charlton tried to send Aldridge on as a substitute but was delayed by an official's sluggishness. Aldo and Big Jack both launched into expletive-laden tirades which were clearly heard by television viewers. When Aldo was finally on, after 6 minutes of trying, he scored a goal to give Ireland a chance to get back into the match. Despite losing the game 2-1, Aldridge's goal was crucial in securing qualification for the second round as they went through on goal difference. In 1996 he became player-manager at Tranmere before hanging up his boots in 1998. While he was manager he led Tranmere to some memorable runs in cup competitions. In 2000 they reached the League Cup final where they put up a tremendous fight eventually losing to then Premiership side Leicester City. The following season Tranmere beat Southampton in one of the greatest comebacks and giant killing acts in FA Cup history. Down 3-0 at half time they came back to win 4-3. They were eventually knocked out in the quarter final 4-2 by Liverpool who were on the way to winning the treble. Unfortunately at the end of the season Tranmere were relegated to Division Two (now Division One) and Aldridge resigned as manager. After leaving Tranmere he began a successful broadcasting career and he now co-commentates on Liverpool games for Merseyside radio station Radio City. His commentary during the 2005 Champions League final was brilliant entertainment as he forgot all professionalism and became a fan once again. Although he only spent two seasons at the club, John Aldridge will always be fondly remembered for his contributions and goals. It’s actually hard to believe it was only two seasons when you consider just how much impact he had. His 26thplace in the ‘100 Players Who Shook the Kop’ series is proof of this. He is one of the greatest goal scorers British football has ever produced with a record of 474 goals in 882 games. I’m incredibly proud that he is also a Scouser and a great ambassador for Merseyside. Thank you so much again Ste.... If you would like to buy Ste Speed's book : Ex-Reds Remembered: 50 Liverpool Players Of The 80s, 90s and 00s, it is available to purchase in Paperback, for Kindle and for iBooks. I was in my teens when Rush walked away from the club to Juve, but was replaced by Aldridge. If I remember correctly, Aldridge came in before the departure of Rush. That time, tele doesn't really have this HD stuff and everything is rather blurry for me and I thought to myself is that a clone or Rushie's twin brother. They looked uncannily similar in look, well from tele in the late 80s anyways. I wasn't sure who is who when the ball was played between them. The Rush depart for Juventus and his clone - John Aldridge took over. And boy was he a great goal scorer. There are two incidents I remembered, and both don't exactly make Aldridge the man that shine the most. Still he was involved nonetheless. The first one was Steve Nicol's goal against Newcastle. Aldridge picked up the loose ball in the middle of the pitch and threaded a through ball at the fullback on the right side of the pitch, Steve Nicol was the player, he was running along the sideline, cut in to collect that sweet through ball, and continued his run leaving the defenders behind. Instead of smashing it in, he chipped the ball over the keeper. The other one was against Arsenal, he got the end of the pass from McMahon's cross at the far post. The move I think was all Barnes cutting the ball in but nobody got to it. McMahon chased the ball down to the sideline, stopped the ball and dribbled past a couple of guys and chipped it over to the far post. The number 8 was there and knocked it in on his slide. He was always the poacher type striker, I cannot remember many spectacular shots outside the box, but he scored plenty. If we ever need someone who is the "fox in the box" type, he is the best example. Hence why I have always liked him, no flashy stuff, get the ball in the box for him and he will get you goals. 20 February1983 - Liverpool v Brighton and Hove Albion, Anfield Stadium, F.A. Cup 5th Round – Lost 1-2. Jimmy Case was sold to Brighton in the summer of 1981 with Mark Lawrenson coming in the opposite direction. Whereas I was happy to see Lawrenson’s arrival at Liverpool, I was gutted that Case left. He was by far the best uncapped player that I ever saw and his contribution to Liverpool throughout my early years as a season ticket holder cannot be undermined. Paisley admitted that selling Case was a mistake and as far as I am concerned, it was a big mistake. Jimmy Case’s goal in the ‘77 cup final was fantastic and his form on the right forced family legend Ian Callaghan into the middle of midfield. He was as hard as nails and his shooting was ferocious. I remember one shot against Benfica in the European Cup Quarter Finals at Anfield, where he missed the target and the ball got stuck in the fencing at the Anfield Road end. It was so imbedded that they could not pull it out, even though plenty of stewards tried. Case signed for Liverpool from Semi-professional South Liverpool for £500 and quickly gained a reputation for his hard tackling and fierce shooting. Bryan Robson, the West Brom and Manchester United legend one said of him “I won’t say he was dirty but certainly the hardest opponent was Jimmy Case. He could certainly look after himself. He was very clever about it as well.” Not that I rate Robson as high as others (in fact, United only started winning things when he retired), but he was good enough for his opinion to be respected and he was not wrong about Jimmy Case. If any player was going to come back and bite us, it was Case, and when we drew Brighton in the F.A. Cup, we all knew the outcome. It was Paisley’s last season and he had never won the Cup. He was left out of the team in the 1950 Cup Final. He had lost as Manager in ’77. He had won three European Cups, 3 League Cups, 6 league titles and a UEFA Cup. He had announced his retirement and this was the last throw of the F.A. Cup dice. Liverpool had gone 63 home cup games without defeat and it was the clubs first ever home match on a Sunday – not because of telly, which is now the norm, but because both Liverpool and Everton were drawn at home and Everton’s opponents, Tottenham, had refused to play on the Sunday. At the time The Sunday Observance Act (1780) prohibited admission to a building on a Sunday for payment. Clubs got around this by allowing free admittance to their ground as payment for such team sheets. Liverpool charged £1.80 for the teamsheet. Brighton’s (caretaker) manager was former Red Jimmy Melia, so with Jimmy Case in the Brighton side, we knew…we just knew. Irishman Gerry Ryan scored the first goal after 32 minutes after a run from future Liverpool star Michael Robinson. Ryan had played for Derby after starting his career with Bohemians and was a good player. Robinson was signed for Liverpool that summer and the rumour was that Paisley had said something along the lines of ‘If I knew how he ran, I would never have signed him.’ The reality is that Paisley had seen Robertson in this game, and besides, Paisley had left and it was Joe Fagan that signed him. Skippy Johnston equalised after 67 minutes with an overhead kick and then came the inevitable. The ball was crossed from the left and after a bit of a scramble, Alan Kennedy headed the ball into the path of Case just outside the area whose shot deflected into the Liverpool net. Phil Neal missed a penalty 5 minutes later and Paisley’s F.A. Cup quest was over forever, reinforcing Paisley’s opinion that he should never have sold Case. I don’t know how Jimmy felt after that goal. It is natural to want to score against previous clubs and I have done that myself, but especially when you are sold in your prime. Luckily, I am going to a Leicester Supporters Club do this coming Saturday with Ian Allen and so I intend to ask him myself. I will also print this chapter out and ask him to sign it for my two wonderful children who will be with me when I meet him. There is no doubt that Jimmy Case is a true Liverpool Legend and I have only written so far about his contribution for Brighton. Case made his debut against QPR in the last game of the 1974/75 season and also played in Bill Shankly’s Testimonial match a few days later (in which he scored two goals. Case established himself the following season playing in 39 of our games. He came on as substitute for John Toshack in the first leg of the UEFA Cup Final when we were losing 2-0 at home to Bruges and then Ray Kennedy, Jimmy Case himself and Kevin Keegan scored after 59, 61 and 64 minutes. 3 goals in 5 minutes when losing in a European Final – I can think of a similar story elsewhere!!! Jimmy Case also scored in the F.A. Cup Semi Final against Everton, and then again in the replay and he our only scorer in the Final too, equalising Stuart Pearson’s goal before Jimmy Greenhoff scored the luckiest Wembley Goal ever to rob Liverpool of an historic treble. A year after UEFA success, Case helped Liverpool win the European Cup for the first time and 12 months later he played against Bruges at Wembley to become one of only a handful of players that have won European Trophies in 3 successive seasons. Case made it a Hat-trick of European Cups when he came on as substitute a few minutes before Alan Kennedy scored the winner against Real Madrid in Paris ’81. Like Norwich in 1994 for the Kop’s Last Stand, Spurs didn’t read the script. Uncle Michael’s last match was the perfect performance when we battered a fantastic Nottingham Forest side 5-0 and I was only one of a number of people that thought it was the greatest performance ever – Tom Finney being another (although I am sure both of us would change our minds having seen some of Barcelona’s performances in the last few years). However. My last game as a Season Ticket holder was the 2-1 victory against Spurs. Dad’s (and Paul’s) last game as a Season Ticket Holder was a dismal defeat, also against Spurs. And it was this game. Not all was gloomy though. As you know from reading thus far, Ian Callaghan has a special place in our hearts, not just because he played more games for Liverpool than any other. Not just because he is the only player to make it from the 2nd Division to European Cup Winner with the Reds, but also his wonderful gesture of bringing the chocolates to my Auntie Lynne after my Grandma died. With it being his last game, I wondered who he would most like to meet, and Cally was the obvious choice. Through a kind contact on RAOTL website, I managed to arrange a meeting for my Dad with the great man. I would have loved to have been there, but it was not possible, but Paul was just as capable so I knew Dad was in safe hands. Paul told Dad that he had to meet a mate in the Main Stand, so Dad went with him. After walking past the European Cup (and the obligatory photo), they entered one of the Anfield suites. Dad spotted Cally straight away and said to Paul “Oh, there’s Ian Callaghan”. Cally immediately made a beeline for them and with outstretched hands said “You must be Eddie”. Dad was totally shocked and Paul gave Cally a trophy to award to Dad for 69 years of watching the Reds. During the conversation, Dad, without prompting, mentioned Cally’s visit to Heswall after Auntie Lynne was orphaned and thanked Ian for this, telling him what it meant to our family. He even mentioned the box of chocolates Cally had given to Auntie Lynne. I say without prompting, I had happened to remind Dad of the story the day before! On completion of the story, Paul produced a box of Chocolates and gave them to Cally. Whilst he could not remember the incident itself, he could remember his friend in Heswall that had told him about the family tragedy and he was delighted with the chocolates which he would “give to my daughter – she will love that story”. We knew that Cally was on duty looking after the corporate guests and so appreciated his efforts even more, and after 10 minutes he had to return to his duties. I cannot express how much this wonderful man means to our family, both on and off the football field. God Bless Ian Callaghan. It is ironic that Dad & Pauls last game (as a season ticket holder) was against Tottenham, because 14 years earlier, my last game (as a season ticket holder) was also against Spurs, although on that occasion we won 2-1 with goals from Collymore. There is a further irony that Collymore scored in that game, as he was the last straw in Ian Allen’s Liverpool Supporting coffin for his display against Coventry a month earlier. Ian is into his Indie music, and one of my favourite tracks from that genre (or any genre for that matter) is I Am The Resurrection by the Stone Roses. Ian is the one of us who has conducted his own resurrection and is now, once again, a season ticket holder at Anfield. Dad kept hold of my season ticket when I gave it up. He thought I may return to the fold and want it back at some point and so sold it to various parties on a season loan. After Ian started going the games again, he bought the ticket on a yearly basis. When Dad decided to give up, it was a no brainer for him to give the ticket to Ian and it is now “officially” his (even if he is an [ahem] idiot”!!!). See Utrecht away for that story! At time of writing (Feb 2015), I have moved back to England with my family. I would love to have a family season ticket to Liverpool, but it is not for me – it is for Christina and Michael. I am so grateful to my Dad for giving me such an opportunity to experience what I have and I want to give that same deep passion to my kids, be it with Liverpool, music or anything else. I am chuffed that Ian Allen has taken on the season ticket and am especially pleased that he has overcome the Premiership demons that made him (and me) give up. I have discussed this with Ian and we both think the same. His decision to give up his season ticket and mine (and Andy’s, Kev’s and Jim’s) were rooted in the same place, but manifested differently. We all had other things happening in our lives outside of football that probably had an impact, but all of us are saddened by the way football has gone. It rained throughout the game itself as if Shanks, Paisley, Fagan and the 96 people in the heavenly Kop were crying because of Dad’s last game, or perhaps because United had won their 19th title the day before to be ahead of us for the first time in their history. A Champions League place was unlikely, but 5th in the table was very achievable. It was an incredible turnaround for The Reds as when Kenny Dalglish took over from Roy Hodson in the New Year, Liverpool were 4 points above the relegation zone and just 5 points above bottom club West Ham. Now, a win against Spurs, (who beat both Milan in the Champions League earlier in the season), would give Liverpool 5th place. A defeat would likely end in 6th with Spurs leapfrogging us. Whatever happened, we would come above Everton. The future looked bright. Dalglish had just agreed a permanent 3 year contract. Luis Suarez was pure class, even if his finishing could improve. It all looked very positive until Luka Modric’s corner was headed out by Martin Skrtel, only for it to fall to Rafael van der Vaart 25 yeards out, whose shot rocketed into Reina’s top left corner to give Spurs the lead. Van der Vaart had spoken to Paul when he was in Derby for the England v Holland U21 game at Pride Park in October 2001. The short conversation between the two culminated in Rafael asking Paul where to go in Derby to get a woman. Paul didn’t know!!! A few years ago, Spurs had not beaten Liverpool at Anfield since before the Titanic sank in 1912. That record came to an end in 1985, and whilst they repeated the feat in 1986, they had not beaten us in the league since (although there was a 1-2 home blip in the Cup in ‘95). Today was looking like another of those days. The Kop was having a go at referee Howard Webb for almost every free kick and contrary to Webb’s denial that he is Alex Ferguson’s illegitimate child as stated in a speech to Derby County ex-pro's to which Auntie Shirley and Uncle Bob were party, The Kop clearly though he was someone’s illegitimate child at least. Webb clearly took exception to the abuse (whether deserved or not) and gave Tottenham a spurious penalty as Jon Flanagan and Luka Modric met shoulder to shoulder outside the area, but remarkably not only did Webb see a non existant foul, but ruled that a penalty should be awarded even though the contact was outside the area. The decision knocked Liverpool for six and when Modric executed the spot kick on 56 minutes, Liverpool destiny of a 6th place finish was complete. Webb blew up and the Anfield crowd wished he had. It was the end of an era for our family. Between the family, we have only missed 3 games at Wembley at time of writing, and they were the last 3 – the FA Cup Semi-Final against Everton in 2012, the Final the same year v Chelsea and the Semi-Final against Villa in 2015. Apart from those 3, a of which were after Dad gave up his season ticket, he has only missed the 1950 F.A. Cup Final v Arsenal (he was 13) and the League Cup Final against Bolton (because of Liverpool’s rubbish ticket allocation). He has attended the other 29 games that Liverpool have played at the national stadium. 69 years of watching Liverpool. 29 Wembley games, most of which were finals. An F.A. Cup final win at the Millenium Stadium too. He was at the Anfield to see us clinch the league in 1964, 1966, 1973, 1977, 1979, 1980, 1982, 1988 and 1990. He was also at Molineux in 1976 when we beat Wolves and The County Ground against Notts County in 1984 to see us clinch it away from home. Dad was there for 11 out of the 18 League Titles to date, and he was a season ticket holder for the 1986 title, but was not at Stamford Bridge for the clincher. 11 league Titles, 3 European Cups, One UEFA Cup, 6 F.A. Cups, 3 league Cups and 13 Charity Shield victories. That is some trophy cabinet and it is likely that no family member will ever see such success ever again. 30 November 1954 - Don Welsh rejected the world’s 4th greatest player. Brendon Rodgers is the 21st manager in Liverpool’s history, and one of only 5 to have failed to deliver silverware (at time of writing – but am hopeful that he will rectify that). George Patterson in the 30’s, Don Welsh and Phil Taylor on the 50’s and then Roy Hodgson in the 2010’s (presuming that Rodgers will win something). That is a pretty awesome record by any club standards, so let’s have a look at those who failed. Roy Hodgson should never have been Liverpool Manager and was given the job by Hicks & Gillett during their attempts to ruin the club. He was never going to be a success and whilst Liverpool Supporters gave him their full support at the start, our fears were quickly realised with abysmal results, performances, tactics and quotes. Patterson was also club secretary, and therefore his role was somewhat diluted. He took over the role(s) in 1928 at the peak of the great depression and finished in 1936, just as war was looming. He was also up against the great Herbert Chapman of Huddersfield and Arsenal fame. I think for these reasons he can be forgiven for not winning anything. Phil Taylor was a Liverpool and England captain before he managed the club. He is the only manager in Liverpool’s history that never managed the club in the top flight, so obviously he had a tough job at the start but came close to promotion season after season with 2 third places followed by a fourth place. He also signed Roger Hunt, who was one of the main reasons that Liverpool went from the second division to being football’s elite, so I think Phil Taylor can be excused for not winning anything under the circumstances. This brings us to the other manager never to win anything, Don Welsh. He was born in Manchester, which is not a good start. There is no doubting his playing credentials as he was a full England international and lead Charlton to the 1946 FA Cup final, losing to Derby (who won every competition that season...yes it was the only competition, but they still won them all) and then lifted the cup as Charlton Captain the following year after beating Burnley. Now whilst talking about the 1946 FA Cup Final, you ask any Derby fan what 3 strange things happened in that final. They will all tell you that an own goal was scored (by Bert Turner of Charlton who then scored for his own side also). They will all tell you that the ball burst, but they will never get the last strange thing that happened. The answer is that Derby won. Be careful though, you may get flattened when giving the average Derby Neanderthal this. So, back to Don Welsh. As a player, no-one can question him, but he must be the worst manager in the history of Liverpool Football Club. Why? The answer is simple. He won nothing and he took us into the second division. He was also at the helm for Liverpool’s record defeat when we lost 9-1 away to Birmingham City, but much, much worse than this, he failed to sign the 4th greatest player ever to play the game. We all know that Billy Liddell, Kenny Dalglish and Steven Gerrard are the greatest players ever to play football, the only question is in which order. After that, Pele, Maradonna and Messi are not so bad, but not as good as our 4th greatest, and on the 30th November 1954, Don Welsh watched a young lad in a trial and decided to ask him back for another. The problem was that at that second trial, he failed to recognise the lads’ talent and dis-guarded him like a 3 month old slab of stilton cheese. Now everyone in Football recognises the name Eddie Gray. He was one of Leeds United greatest ever players, and he happened to share his name with my Dad – and it was he who Don Welsh failed to spot, even when given a second chance. My Dad was devastated, so instead of going on to play for Arsenal and England alongside his hero; Joe Mercer, he went on to play for Congleton Town and then The Standard Pub in Anfield. Now many may mock that the 4th greatest ever player only played for a pub side, but this was no ordinary pub side. This was the team that a young lad called Roy McFarland came for a trial and was rejected. McFarland then went on to play for Tranmere Rovers, win a couple of League Titles with Derby County and even play for England. It is clear from The Standard Pub days that he was not as good as my Dad (and that is after the disappointment of rejection by Welsh which ruined his career) and therefore, by definition, Don Welsh threw away one of the world’s greatest ever players. It is no coincidence that he is the only bad Liverpool manager in history along with Roy Hodgson – the current England Manager. Note – there is a rumour that McFarland would have been accepted by the Standard Pub team, but his mate was not good enough and the team would not accept both of them, with McFarland therefore deciding not to join. "When Arsenal and Liverpool qualified for Wembley I was no longer allowed to train with the Liverpool players, I used to train on my own in the afternoon but whenever I bumped into the Liverpool players I told them they were certain to beat us in the final. I fostered their confidence and it gave us an advantage. At Wembley we beat them fairly and squarely. We just clicked that day and the rain - it never stopped - suited us." The team selection itself caused controversy, with George Kay and the selection committee voting 5-4 in picking Bill Jones or Laurie Hughes (depending on opinion) ahead of Bob Paisley. Paisley had scored in the semi-final against Everton, but missed the four league games prior to the final through injury. Even though Paisley had proved his fitness, Kay and the committee still left him out. Paisley said that this disappointment set him in good stead for his managerial career because when he told a player that he knew how he felt when they were dropped, they knew that he was talking from experience. Born in Waterloo, Liverpool, Laurie Hughes was a classy centre half whom I believe to be of a similar mould to Alan Hansen. His reading of the game, like Hansen, was second to none and he shared Hansen’s ability in the air too. His career started at Tranmere after, in his own words, “Liverpool and Everton didn’t want to know me” after thinking he was too small to make it as a professional, but he was a late developer and Liverpool soon recognised his ability and signed him in February 1943 after only 2 years with the Superwhites. He went on to play 326 times for Liverpool and scored his only goal against Preston North End in 1951. Such were his performances, that he won 3 international caps for England in the 1950 World Cup in Brazil, playing Chile, United States and Spain before England’s disappointing exit. Hughes was the first man to debut in the World Cup Finals for England (the last one being Allan Clarke), and I believe that he is the only man whose only caps were in a World Cup Finals tournament. Hughes continued his Liverpool career until his retirement in May 1960, although his last game was in September 1957 at the age of 33, and his last for the reserves in October 1959, just before the arrival of Bill Shankly. He goes down as one of many quality centre halves that has graced that Anfield turf and a real Liverpool legend. Laurie Hughes died on the day of the terrorist attack on the World Trade Centre I New York. He was 87 when he died. Talking of tragedy, the Liverpool team for this first Wembley Cup Final in 1950 included Kevin Baron; an inside forward who played 153 times for The Reds, scoring 32 goals. At time of writing, in Liverpool’s last FA Cup Final in 2012, Steven Gerrard was in the Reds side. Both these players share an unfortunate connection in that they lost family members at Hillsborough. Kevin Baron’s older brother Gerard was the oldest victim at 67. Steven Gerrard’s cousin Jon-Paul Gilhooley was the youngest victim aged just 10. Both teams played their home games in red, and both changed to their away kit for the final, Liverpool in white shirts and black shorts, Arsenal in gold shirts and white shorts. Two goals from Arsenal’s Reg Lewis was enough to take the cup to North London. The Liverpool Echo wrote in that evening’s paper “Liverpool fought gallantly, but they were just not quite good enough in attack to overcome Arsenal's cast-iron defence." Even though there was massive disappointment, 100,000 people still lined the streets of the city centre and cheered the runners-up upon their return home. The week before the final, a snotty nosed 13 year old kid (who went on to become my father), was kicking his ball about in the Anfield car park with his autograph book in hand waiting to see who was about. Mercer came out of the players’ entrance and was approached by my Dad. Mercer was carrying a ball and after Dad asked him for an autograph, he straight away pointed to the wall outside in the Anfield Car Park that had goal posts painted on it and told Dad to go in goal while he took shots at him. After a while, the great man went in goal and Dad tried to score against him. This went on for about an hour before Mercer apologised that he had to go and do the wife’s shopping, signed my Dad’s autograph book and went on his merry way. Dad was the happiest boy on the planet and you can still see the glint in his eye when he tells the story. He is still my Dad’s biggest hero to this day. A few days later, Mercer lead Arsenal to F.A. Cup glory, but the blow of losing the Cup Final was lessened because of the man who beat us and lifted the trophy. ...Well the blow was lessened slightly for my Dad. Auntie Peg and Uncle Michael; however, had made the trip to Wembley and were suitably gutted. Auntie Peg once described losing that game as ‘horrible’. This was the first time anyone from our family had been to Wembley. This was the first time Liverpool had been to Wembley and there were 100,000 applications for the 10,000 tickets made available to Liverpool. The other family story of that day is that my Grandad on my Mum’s side was a staunch blue. When Liverpool were 2:0 down, he told my 8 year old Mum to go upstairs and say a prayer for Liverpool, which my Mum duly did. This was unheard of for my Grandad to want a Red win and I loved hearing that story when my Mum told me. I think that in itself would have been enough for me to completely lose my faith in God upon hearing the end result and God’s refusal to answer that prayer, but Mum persevered in her faith and went on to win The Bene Merenti medal from the Pope (and even Kenny Dalglish never managed to win that one – although Maria Von Trapp of Sound of Music fame did). @Zico Nealy, that's some detailed description you got there of McMahon's move. I met him a few years back in ESPN Asia meeting/conference and spoke to him about his game and the new breed midfielders. He was very vocal about how the new players are being cradled into the game and too lightweight compared to the old days. Stout frame as ever, much bigger now, but his skills hasn't left him. How do you remember Stig Inge Bjornebye in a Liverpool shirt? Is he remembered most for that 1996/97 season? What match epitomized his grit and determination? What were his strengths/weaknesses? What are your best memories of him as a player? Those crosses to Fowler and Collymore63 goals? How will he be described in generations to come? In detailed analysis, describe and let us know here how you will always remember Stig Inge Bjornebye during his Liverpool career? "After a slow start and some unfortunate injuries, the Norwegian left-footer made a real impact in the 1996-97 campaign. He offered great balance and solidarity down the left, providing the types of crosses not seen since John Barnes in his pomp. The amount of chances Bjornebye created for the likes of Robbie Fowler and Stan Collymore enabled the strike-force to notch a hatful of goals and, as a result, he was named alongside fellow reds Mark Wright and Steve McManaman in the PFA Team of the Year." Bjornebye was bought during the Souness era when suddenly we were buying players with weird names who we'd never heard of like Torben Piechnik and Istvan Kozma. Poor Stig got lumped in with them so we didn't expect much from him. Like most players he did very little under Souness but came alive during the Roy Evans years when we started to play with real flair and ambition. I don't have any recollection of his defensive qualities at all. That's not to say he didn't have any. All I remember is that he had a very sweet left foot and his crossing was superb. There are two stand-out moments for me. The cross for Neil Ruddock to head home the equaliser in the epic 3-3 with Manchester United in 1994 when we came back from 3-0 down (what a header that was, incidentally from Ruddock. Can't remember ever seeing a header hit with such force). The second was his assist for Fowler's winner in the second 4-3 win against Newcastle in 1997. This time we'd somehow managed to throw away a three goal lead. It was typical of that team. So talented, but very careless and ill-disciplined. I was about to put my foot through the TV after Newcastle had equalised when Bjornebye got away down the left and put in an inch-perfect cross for Fowler to head home in front of the Kop. A great moment. That season he stood out for us, because he was able to get a good run of games. A good rather than great player who didn't realise his full potential largely due to a succession of injuries. Then came the 1994/95 season, he began to slowly establish himself in that wing back position, still remember him in the League Cup final victory over Bolton at Wembley, (think he hit the post that day with a shot?) Just three days later, against Southampton he broke his leg which meant he missed most of the following campaign playing only two games during the 1995/96 season. Then came that season, the 1996/97 season, the season i'll always remember him for - the season he was voted into the PFA team of the season. ... Am I right in saying during that 96/97 season, he made 38 league appearances and made 15 assists? My memory of Stig is... Crossing was decent at times, but sometimes struggled to track back if we were hit on the counter... That 96/97 season started perfectly for Stig, he scored the first goal of the season in our 3-3 opening game against Middlesbrough, the Ravanelli show! Stig opened the scoring just four minutes in, when he powered the ball home after John Barnes had played a free kick into the Middlesbrough penalty area. One of the best opening day matches i've ever seen... Juninho and Fabrizio Ravanelli... Those were the days! I thought it was Staunton that came in and started to take over the left back position and eventually took Bjornebye out of the first team? @lfc.eddie, I think you could be right... Memory cells are fading here! Thought it was Matteo who ousted Bjornebye from that left back position, always thought Gerard Houllier saw Dominic Matteo as a left back, then Houllier opted for the experience of Staunton at left back leaving Matteo with a fight to re-establish himself. Training in the 1973-74 season : Liverpool FC football team on their training grounds. Among those seen are Alan Waddle, Alec Lindsay, Phil Thompson, Jimmy Case, Bob Paisley, Bill Shankly, Ray Clemence, Ian St John, Kevin Keegan, Emlyn Hughes. if you recall our win over YMPA 47 in the 90s I suggest your doing ok in that department mate!